Want to buy land within the Jacksonville area? A lot of investors love vacant land as an investment! If you’re thinking about doing a land deal, make sure you weigh these 5 site characteristics before buying raw land for development in Jacksonville. In many residential areas, boundary markers like fences, sidewalks, and roads mark the legal boundaries of a home. But with vacant land it’s not always as clear. Depending on where the land is, it can be difficult to tell where your property ends and another one begins. Before you even invest, make sure you know exactly where the legal boundaries of your property are so you don’t develop beyond those boundaries. Municipalities will zone different areas in order to control growth. After all, no homeowner wants a garbage dump or noisy factory beside them! Zoning will restrict what you can build. So, if you’re investing to develop the land, or if you’re planning to sell to a developer, make sure you know what can be built on the property. Note: even if you don’t like the drainage line, you can often change it (within reason); however, it’s good to know where the water drains before you start building any structures! Vacant land has so many promising possibilities but not all land is appropriate for every use. The make-up of the soil will determine if and where a structure should be built on the property, and even how deep you need to dig for a sturdy, dry structure. Want to know the best place to buy vacant land? It’s easy: in the area that’s going to be developed in the future! 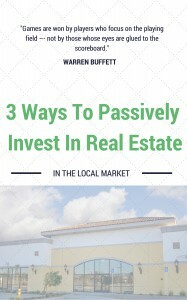 The value of your investment will rise as demand increases for the land around it. So, determine the path of growth so you can know where your next land investment should be. Vacant has historically been a compelling investment. (After all, ALL land was vacant at some point!) If you want to buy land within the Jacksonville area, make sure you weigh these 5 site characteristics before buying raw land for development in Jacksonville.